I experimented a little the other day for dinner. 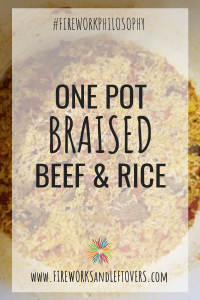 This One Pot Braised Beef & Rice is so simple and wonderful and is sure to become a regular occurrence at our dinner table. I was inspired by the Pioneer Woman’s recipe for Beef Stew which is in her Food From My Frontier cookbook. 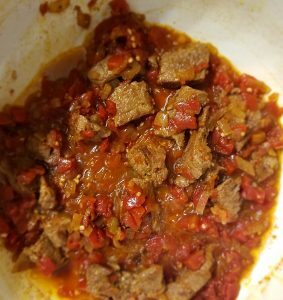 The stew meat is braised low and slow until it’s super tender and delicious and after making the stew for dinner one Saturday evening, I wanted to cook the extra meat I had thawed using the same process but for an entirely new meal on Sunday evening. Spoiler alert…I actually didn’t use stew meat. I used t-bone steak. You see, our freezer stash of beef is dwindling so I have to work with what I’ve got! 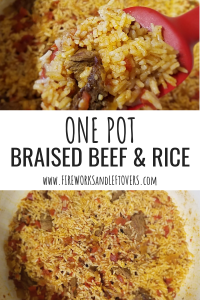 My cherished dutch oven was put to work twice in one weekend for not only the stew but this One Pot Braised Beef & Rice. It retains heat beautifully and is ideal if you’re cooking anything on the stove low and slow. Plus, they’re great for one pot dishes like this one! I love my plum-colored dutch oven but I secretly have a crush on The Pioneer Woman’s linen-colored dutch oven too! So simple and classic and that butterfly handle…love! 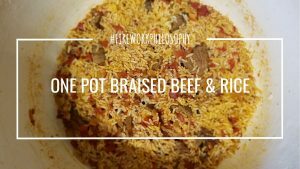 With my dutch oven and cubed t-bone steak ready to go, I gathered up a few simple ingredients I had on hand including beef stock and instant rice and wound up with this new, tasty creation. Check the notes section in the recipe below for more ideas for variations and add-ins. I do have to say The Farmer wasn’t the biggest fan (too many chunks of tomato from the Rotel) and Little E made a solid effort to try it (but the Rotel made it a bit too spicy for her toddler taste buds). If you don’t have any tomato-loathing or spice-averse humans in your house to feed, than you’ll enjoy this too. I certainly loved it – I wouldn’t take the time to share this recipe with you if I didn’t – and the leftovers were perfect for me to take to work for lunch later in the week. Note that this recipe makes about 3-4 servings. You can easily double it if you’re feeding more people. This tender and flavorful one pot dinner uses a few simple ingredients. It's sure to become a go-to dinner idea! Preheat dutch oven over medium heat. Add Simply Sunflower Oil and meat. Sear on each side until browned, about 3-4 minutes total. Transfer the meat from the dutch oven to a clean plate and set aside. Add chopped onion to the dutch oven and cook for 2-3 minutes or until onion in translucent. Add chopped garlic, stir to combine and saute another minute. Add a few splashes of beef stock from the 1/2 cup measure to deglaze the pan, scraping the bottom of the pan to loosen the browned bits of meat and onion - they're full of great flavor! Once the pan is deglazed, add the remainder of the 1/2 cup of beef stock and the can of Rotel. Return the seared meat to the pan along with any juice from the plate. Cover the dutch oven and simmer on low for 45-60 minutes until the meat is tender and the majority of the liquid has been absorbed. After 60 minutes or at the point when the meat reaches the desired tenderness, add 1/2 cup water and the remaining 1 cup beef stock. Increase the heat to medium and return to a boil. Once the liquid is boiling, add the instant rice, stir to combine, cover the pot and remove from heat. Let sit until the rice is cooked, about 5-6 minutes. TIP: Add a total of one cup of drained and rinsed black beans and/or frozen corn when you add the rice for additional variations! 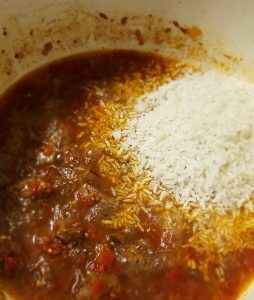 TIP: If you're not feeling the Mexican food flare with the Rotel, use a can of diced, stewed tomatoes and season with Italian seasonings. What’s your favorite one pot dinner?